Sewn With Grace: Tickled Pink! I've been looking forward to sharing with you the latest addition to my kitchen, my new kitchen island! My friend John made this for me out of an old buffet that he found. 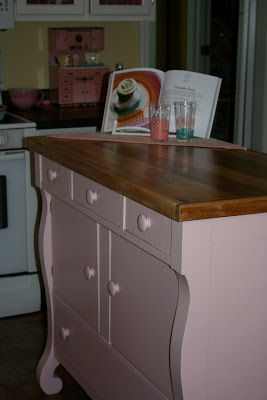 All it needed was some loving care, a fresh coat of pink paint, a new top and it was good to go! I love the beadboard that he placed on the front of it. He has stamped his name on the inside of one of the drawers and I love that every time I open it, I think of him. I have limited storage space in my pantry and am so pleased that this is big enough to hold all of my baking supplies. My friend, Diane, painted this old Singer sewing machine stand white and asked me if I wanted it - did I ever! It makes a great end table in the pretty room and a great space to store the cute stuffed lamb that my friend Joyce gave me. My first machine was a Singer, as was my Mom's and my Grandma's so I especially like having this piece. I am truly tickled pink! Well, it's not wonder you are tickled with your new kitchen addition. It is great. I love, love, love beadboard and have it all over my house. I had an old Singer Stand and gave it away a few years back...now I want it back. That is so cute. That is the cutest island! You are going to have so much fun with it! Hope you had a good weekend! Ours was so busy. Both are adorable, Renee. True treasures in your beautiful kitchen. Love your pink kitchen island..and the singer table...such fun pieces to have! Your Singer stand looks so cute too. How incredibly thoughtful of Joyce to give you that adorable lamb!! She is a sweetheart for sure! What a great island - one added benefit you may find is that you can move it. We have an old farmers table that we use as an island and to me that is one of the best benefits. 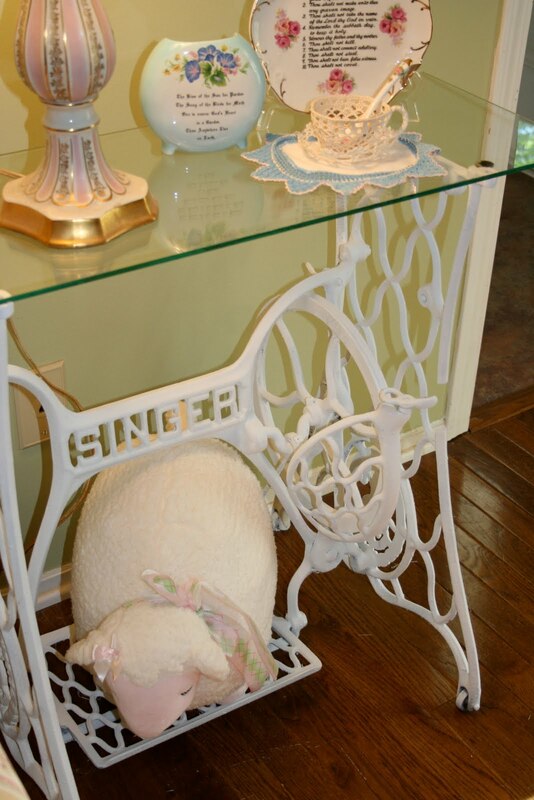 And I love the singer end table - what a great idea. Your new island looks beautiful. I know you are enjoying it. I love the old Singer Stand too, what a creative thing to do with that.